My previous post on the Marrowmen on law and gospel received, it is fair to say, a mixed reaction. 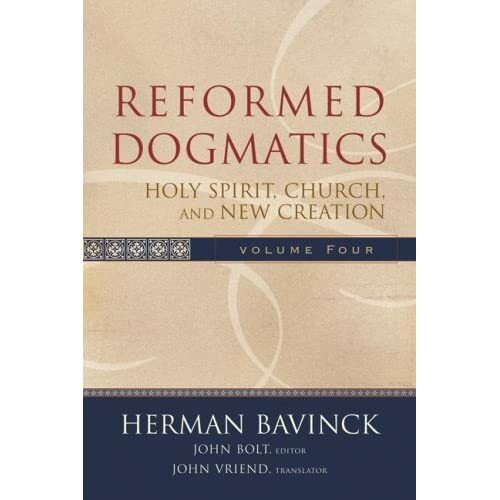 Perhaps Herman Bavinck can clarify some of this for us as his recently translated Reformed Dogmatics (Vol 4): Holy Spirit, Church, and New Creation (Grand Rapids: Baker, 2008 ) contains a helpful discussion of “Maintaining the Unity of the Covenant of Grace” (p448-51). Bavinck notes there are two extremes to be avoided in the discussion of the law/gospel distinction, “on the one hand … antinomianism” and “nomism … Pelagianism, semi-Pelagianism, Romanism, Socinianism…” (p451). He states that law and gospel were not viewed as antithetical by “Scholastic and Roman Catholic theologians, [as] law and gospel were equated with the Old and New Testaments” (p451). Rome therefore held that “Law and gospel do not differ in the sense that the former only demands and the latter only promises, for both contain commandments … and promises …” (p451-2). For Rome the New Testament (gospel/new law) surpassed the Old Testament (old law) in its clarity of revelation and permanence. Bavinck sees much to agree with here but he does not see the Old/New Testament distinction as the Scriptural law/gospel antithesis. The true antithesis is only perceived when we consider “the law as law, apart from the promises, to which in the Old Testament the law was made subservient” (p452). It is speaking of the law in this way that “Paul asserts that it cannot justify, that it increases sin, that it is a ministry of condemnation … and precisely in that way prepares the fulfillment of the promise…” (p453). It is “this antithesis between law and gospel [that] was again understood at the Reformation” (p453). So “although in a broad sense ‘law’ and ‘gospel’ can indeed be used to denote the old and new dispensation of the covenant of grace, in their actual significance they definitely describe two essentially different revelations of divine will” (p453). Thus in Scripture “law and gospel are contrasted as demand and gift, as command and promise, as sin and grace, as sickness and healing, as death and life … the law proceeds from God’s holiness, the gospel from God’s grace” (p453, emphasis added). Now Bavinck sounds suspiciously like a Marrowman at this point – the law gospel antithesis can be expressed as the difference between a command and a promise. How then does Bavinck answer – “And indeed, strictly speaking, there are no demands and conditions in the gospel but only promises and gifts. Faith and repentance are as much benefits of the covenant of grace as justification (and so forth)” (p454). This is exactly what the Marrowmen were trying to say. There is a “strict” sense in which we can speak of the gospel as promise and not command. So, in the proclamation of the gospel “it is always united with law and is therefore always interwoven with the law throughout Scripture. The gospel always presupposes law and also needs it in its administration … The demanding and summoning form in which the gospel is cast is derived from the law” (p454). So “Faith and repentance are … demanded of people in the name of God’s law… (p454). So far, so Marrow. But Bavinck adds some caveats to what he has said, “But faith and repentance themselves, nevertheless, are components of the gospel, not the workings or fruits of the law” (p454). By this Bavinck seems to mean that the law demands faith in general but “it does not demand the special faith that directs itself towards Christ” (p454). [As an aside, once the gospel reveals Christ I think the law does demand special faith in Christ.] Thus “faith and repentance are components of the gospel … Law and gospel, viewed concretely, do not so much differ in that the law always speaks with a commanding voice and the gospel with a promising voice, for also the law makes promises and the gospel utters admonitions and imposes obligations. But they differ especially in content: the law demands that humans work out their own righteousness, and the gospel invites them to renounce all self-righteousness and to accept the righteousness of Christ…” (p454). If I have understood him correctly I am happy with what Bavinck proposes (although I would probably replace ‘viewed concretely’ with ‘viewed largely’). He recognises the “strict” sense that the Marrowmen spoke of and also another broader sense in which we can speak of gospel as containing commands.